You'll be £25.00 closer to your next £10.00 credit when you purchase Sparta at War. What's this? Order within the next 4 hours, 5 minutes to get your order processed the next working day! During the eighth century bc, Sparta became one of the leading cities of ancient Greece, conquering the southern Peloponnese, and from the mid-sixth century bc until the mid-fourth, Sparta became a military power of recognized importance. For almost two centuries the massed Spartan army remained unbeaten in the field. Spartan officers also commanded with great success armies of mercenaries or coalition allies, as well as fleets of war galleys. Although it is the stand of the Three Hundred at Thermopylae that has earned Sparta undying fame, it was her victories over both Persian invaders and the armies and navies of Greek rivals that upheld her position of leadership in Greece. Even a steady decline in Spartiate numbers, aggravated by a terrible earthquake in 464 bc, failed to end their dominance. Only when the Thebans learned how to defeat the massed Spartan army in pitched battle was Sparta toppled from her position of primacy. Scott Rusch examines what is known of the history of Sparta, from the settlement of the city to her defeat at Theban hands, focusing upon military campaigns and the strategic circumstances that drove them. Rusch offers fresh perspectives on important questions of Spartan history, and illuminate some of antiquity's most notable campaigns. interest readers with an examination of the city-state of Sparta in times of war over the two centuries between 550 and 362 BCE. The author has organised the main body of his text in twelve chapters devoted to Messenians and Athenians, the Persian invasions, the end of the Spartan Empire, and a wide variety of other related subjects. This well-researched book will be enormously valuable for all those embarking on an interest in the Golden Age of Greece. This well-researched book will be enormously valuable for all those embarking on an interest in the Golden Age of Greece, but it will also be valuable for established enthusiasts and scholars. A rewarding read. In Sparta at War, classicist Rusch gives us a detailed look at the most admired military force of “Golden Age” Greece. Although it opens with a survey of the early history of Sparta and the origins of its unique social and military institutions, Sparta at War concentrates on the period during which the city-state was most influential in the affairs of Greece, from roughly the sixth century BC through the fourth. Rusch devotes a chapter to the imposition of Spartan dominance over the Peloponnese in the sixth century, and follows this with two chapters on the Persian Wars (c. 490-475 BC). There follows a chapter on rising tensions with Athens, including the First Peloponnesian War (460-445 BC) and its consequences. Three chapters are needed for the Great Peloponnesian War (431-404 BC): one each for the early period of Athenian success, the Spartan revival, and the final campaigns and collapse of Athens. The last four chapters cover the Spartan dominance over the Greek world, the eclipse of Sparta by Thebes, and the long decline of the city. Rather than leap to conclusions over sometimes thorny questions of historiography, Rusch often usefully reminds the reader that there is much we don’t know even about this relatively well-documented period, a refreshing change from some overly definitive treatments of these events. Although written primarily for those having only a passing familiarity with the “Golden Age of Greece”, Rusch's analysis will likely to be of interest to the more serious student of the period as well. Perhaps the ancient culture that is most likely associated with war is Sparta, which is the subject of Scott Rusch's easy-to-read Sparta at War. This book is excellently illustrated with maps, and presents the history of the period 500-362 BC in an engaging and lively manner. It is rather extraordinary to think that, no one before Scott M.Rusch has though to attempt what he has pulled off rather triumphantly here – a battle-by-battle account of Spartan armies' performance on the field. This is a most serviceable and highly recommendable volume. Rusch uses his sources well. I was interested to read about the limited sources for some of Sparta's early wars - the First Messenian War appears to come from a reference in a later poem! It's also rather refreshing to read an account of the Great Peloponnesian War written from the Spartan point of view. 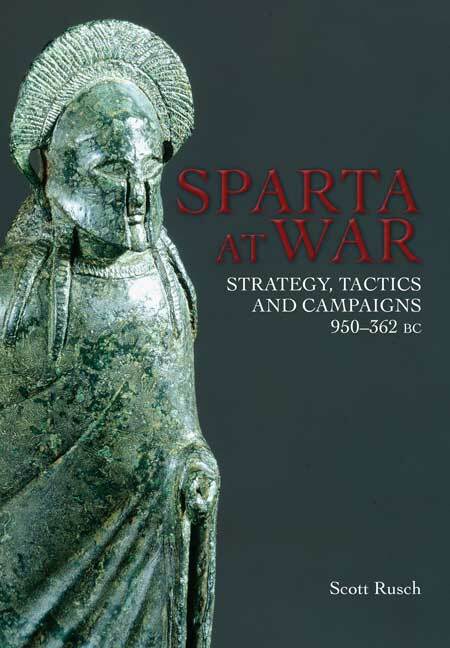 This is a very readable examination of Sparta's military history, with enough use of the sources to back up the text but that avoids getting bogged down in too many technicalities. Scott Rusch studied Greek and Roman history at the University of Pennsylvania, where he received his Ph.D. in 1997. Reflecting his lifelong interest in military history, he examined in his dissertation Greek military operations during the Peloponnesian War, a valuable preparation for this work. He has written on ancient military history for many publications.